Below are four ply-splitting books that you can order from me. Please see my Links page for other excellent ply-splitting books, along with information on where to purchase them. Click here to see photos of all of the braids & bands in the book. Self-published in 2014, 222 pages, over 500 black & white photos, 8-1/2" x 11", comb-bound. Detailed step-by-step photos and instructions for 25 ply-split braids and 3 ply-split bands. I used 10/2 perle cotton to make the cords, and the focus is on structure and design. Instructions include specifications for cordmaking. 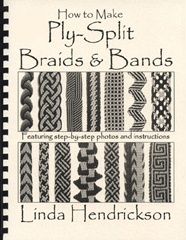 My intention with this book is to help you learn the basic techniques of ply-splitting by making a set of small, functional samples -- ply-split braids and bands on key rings. The format for each project is the same. Each project begins with a starting loop. This is formed by making a SCOT braid about 1-1/2" long, and the cords are then interdigitated to form the loop. Each project ends by making a wrapping around 1 or more groups of cords, and making a simple knot at the end of each cord. I have limited the size of the design area of the braids and bands to a small rectangle, with the width between 6 and 16 working cords, and the length no longer than 5". Click here to see photos of all of the baskets in the book. Self-published in 2010, 180 pages, over 400 black & white photos, 8-1/2" x 11", comb-bound. The first book on the subject of ply-splitting as a basket technique, How to Make Ply-Split Baskets has step-by-step photos and detailed instructions for 12 baskets. I used Wraphia II paper ribbon in Kraft and Black to make cords for all of these baskets so the focus would be on structure and design. Instructions include specifications for cordmaking, and you can make cords from anything you wish. Concepts in the book include various starts and rim finishes, how to create different ply-split structures, and how to make geometric designs. 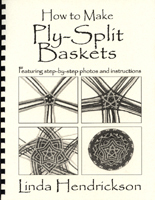 Once you understand the concepts in this book, you can use your knowledge to create your own ply-split basket designs. Self-published in 2000, 28 pages, 5-1/2"x8-1/2". SCOT is a technique in which one cord is pulled through many to create textured and colored ridges as well as angles and curves. This booklet begins with instructions for making the tightly-twisted 4-ply cords needed for ply-split braiding. Includes procedures for making cords with a drill and a single hook, and with 4-hook twisters, and has suggestions for decorative cords. Step-by-step directions for making a variety of shaped braids and star ornaments. Bellew Publishing and Unicorn Press, 208 pages of text and illustrations plus 120 B&W photos, 1998. The result of over 10 years of research and several trips to India. 208 pages of text, 196 diagrams by Ann and Ralph Norman, 120 B&W photographs of traditional ply-split camel girths and their makers, and Peter's innovative samples. Clear instructions for making cords and for many variations of each of the three different ply-split braiding techniques, plain oblique twining (POT), single course oblique twining (SCOT), and two-layered oblique interlacing (TLOI). Ply-split braiding offers exciting possibilities for jewelry, baskets, mats, rugs, and wall hangings. This page was updated on June 7, 2017.